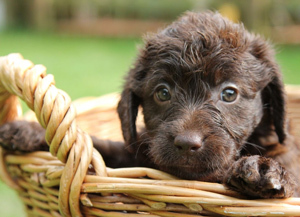 Within the Labradoodle breed, whether the dog is miniature, medium or standard in size, the chocolate colored puppies are usually the first picked! While the chocolate Labradoodles are among the most common coloring in the breed, I don’t blame perspective owners for choosing the adorable brown coated, brown eyed treasures as their forever friends. 2 What is a Chocolate Labradoodle? 3.1 What Genes Create a Chocolate Labradoodle? 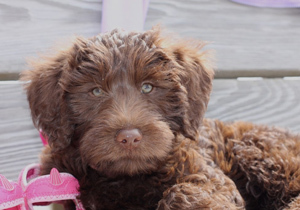 While the chocolate Labradoodle only refers to a brown colored Labradoodle, there are a couple of interesting facts you should know if you are hoping to purchase one from a reputable breeder. A true chocolate Labradoodle will never have a black nose. Due to the genetic makeup of this dog, it will always have a brown or liver colored nose. Chocolate Labradoodles have one of the two gene makeups: bbEE or bbEe. This means that breeding two chocolate Labradoodles with gene makeup bbEE, the puppies will never be cream. The puppies will always be brown or black shades. If two chocolate Labradoodles have bbEe and are bred, the puppies can be a range of colors including cream, chocolate or black. Due to this reason, serious chocolate Labradoodle breeders will often have mothers and fathers with the bbEE gene makeup. 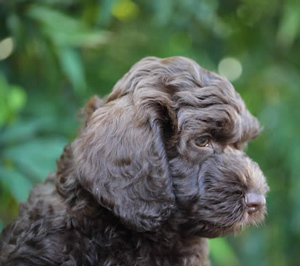 While you can take your chance of purchasing a chocolate Labradoodle from any reputable breeder of these dogs, if you have your heart set on only obtaining a chocolate colored puppy, finding a breeder that specializes in breeding chocolate Labradoodles is your best bet. 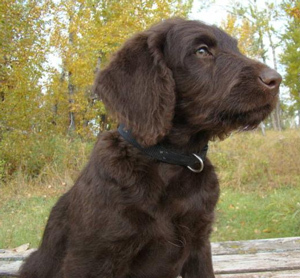 Due to chocolate Labradoodles being among the most popular coloring, many breeders have dedicated time into a blood line of chocolate doodles. 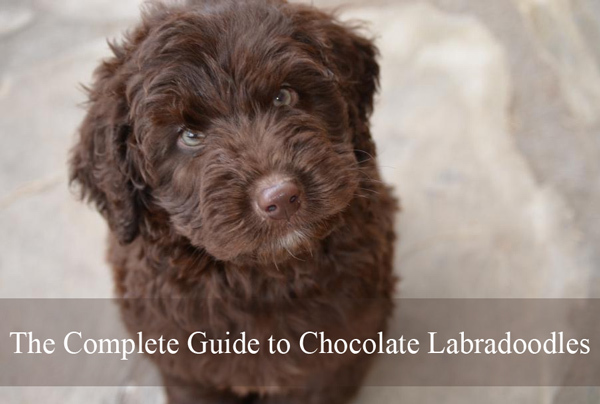 What is a Chocolate Labradoodle? 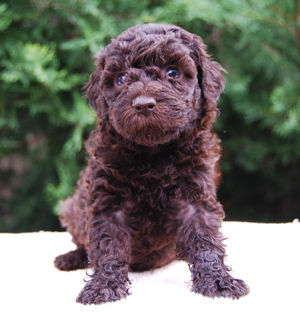 The chocolate Labradoodle refers to the all brown Labrador cross Poodle puppies. 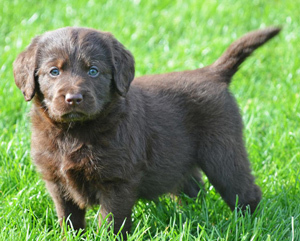 Generally if a Labradoodle puppy is chocolate colored at birth, his coat will remain rich chocolate in color or will fade into a brown color once they reach adulthood. 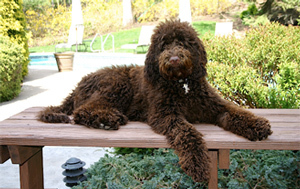 Like all other coat colored Labradoodle’s, the chocolate Labradoodle also sports a hypoallergenic coat. While purebred Poodles are the best choice for allergy suffers, many Labradoodles can be the perfect allergy suffers best friend. The only problem is that if the Labradoodle takes after the coat of the Labrador parent, their coat may not be as allergy friendly as one may have liked. When speaking about the Poodle parent of the Labradoodle, they come in a variety of colors from black to cream although there is no surprise that chocolate/brown is the most common. The Labrador parent of the Labradoodle can come in a number of colors although Labradors are generally cream, chocolate or brown in color. To understand what color puppies an expectant dog mother will give birth to, you need to understand the genetics behind coat colors. Within Poodles, Labradors and then Doodle breeds, two pairs of genes ultimately determine the majority of the puppy coat colors and textures. The two genes that determine coat color are B/b and E/e. B stands for the black gene and b stands for the brown gene. If the other gene in the mix is an E than the puppy generally speaking will be black or brown. If the other gene in the mix is an ‘e’ than there is a chance the dog will come out cream, caramel or another part color. There are other gene options in the mix that can produce those Labradoodles with silver and grey coloring. When speaking of the black gene, this can also produce a silver or blue coat, the brown gene refers to chocolate, brown and cafe colors and the cream gene can be white through to light red. A dog will only need one dominant gene to express that color for example B or E, while it will need two recessive genes for the coat to be of that color, eg, b and b. Chocolate Labradoodles have a recessive gene. 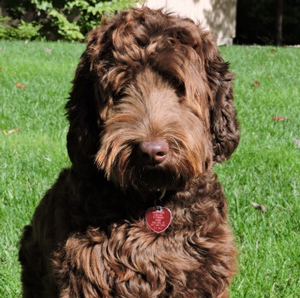 What Genes Create a Chocolate Labradoodle? While the table above may appear confusing for some, to sum it up, all dogs that have the gene mix ‘ee’ will have cream coats, all Labradoodles with genes ‘bb+E’ will be brown, and all Labradoodles with two dominant genes ‘BE’ will be black. Each puppy within the litter will get one B/b gene and one E/e gene from each parent which allows knowledgeable breeders to make an informed guesses of the colors that will be present in the litter. 2 parents with gene makeup: BBEE. All the puppies will be black. 2 parents with gene makeup BBEe. All the puppies will be black or cream. 2 parents with BBee. They do not carry the recessive brown gene need for chocolate Labradoodles. 2 parents with gene makeup: BbEE or BbEe although there will not definitely be a chocolate Labradoodle. 2 parents with gene makeup: Bbee. Small possibility of chocolate puppies. As we’ve discussed in our earlier article; Labradoodle Colors, this breed of dog can sport a number of different coat colors. While it is really pot luck what colors puppies from a litter are, the nose pigment of a Labradoodle will often determine what color their coat is. There are two main types of Labradoodle pigments, the black pigment Labradoodles and the liver pigment Labradoodles. 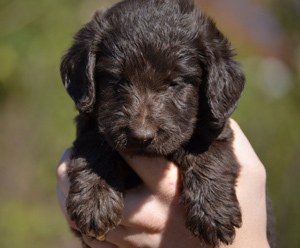 Black pigment Labradoodles always have dark brown eyes, black noses and black toe nails. These black pigment Labradoodles then sport one of the following coat colors: Chalk, Cream, Apricot, Gold, Red, Black, Blue, Silver or Tri-Color. The liver pigment Labradoodles is the category in which we will find our beloved chocolate Labradoodles. 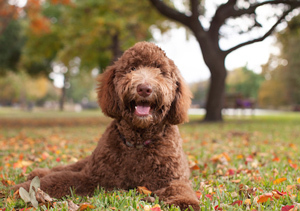 Liver pigment Labradoodles have medium to light brown noses and eyes. The coat colors of a liver pigment Labradoodle can be one of the following: light to deep caramel, red, chocolate, lavender, cafe or parchment. Dog Pigment Definition: The color of the eye rims, paw pads, lips and most commonly seen through the nose color. 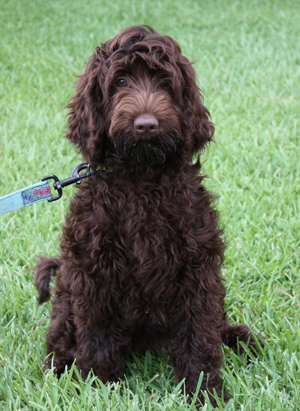 Thinking about adding a chocolate Labradoodle to your family? See a collection of the cutest chocolate Labradoodles below.